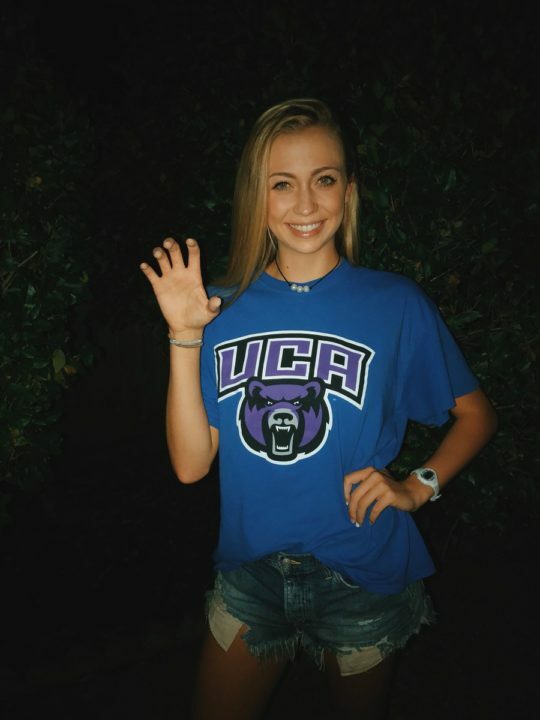 Class of 2019 middle blocker and right side Kailee Moon has verbally committed to the University of Central Arkansas women’s volleyball program. An attendee of Katy Taylor High School in Texas, Moon is in her senior season this fall and third year of varsity according to her MaxPreps profile. The page also notes that so far this season, Moon has recorded 109 kills (1.7 per set) on a .194 hitting percentage, 69 blocks (1.1 per set), 19 digs (0.3 per set) and 12 aces (0.2 per set). In total for her career thus far, she has 312 kills (1.3 per set) on a .233 mark, 222 blocks (0.9 per set), 50 digs (0.2 per set) and 17 aces (0.1 per set). On the club circuit, Moon plays for the Texas Tornados 18 Mizuno squad. Highlights of her play can be seen here via her SportsRecruits page. Joining Moon as part of the class of 2019 will be Hannah Crawford, a defensive specialist/libero from Texas as well and Clear Springs High School. Central Arkansas is off to an 8-2 start to the 2018 season with a roster that features four middles and two opposites – with one of each set to graduate at the position Moon will join in 2019. The Bears also went 27-5 (13-3 Southland) in 2017 along with an NCAA Tournament appearance.